The group says parties are too reliant on "familiar faces"
The number of women standing for election in this week's assembly poll has fallen since the last one in 2003. The independent group Women into Politics has said this is disappointing as in 2003 women won only 18 of the 108 seats. The organisation's May de Silva said more has to be done to ensure women take an active roll in politics. She urged the media and political parties to do more to increase the profile of women candidates. "Political parties have a tendency to put forward their 'familiar faces' for TV and media interviews, most of whom are men," she said. "Women make up 51% of the population and this time around we have three fewer women candidates standing in this election than in 2003. "Maybe if we had more women in politics, we would have progressed a lot further than where we are today." 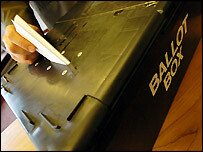 The Northern Ireland Assembly election takes place on Wednesday 7 March.